This blog has been a little bereft of photos lately and I fear wall-to-wall text could scare potential readers off. 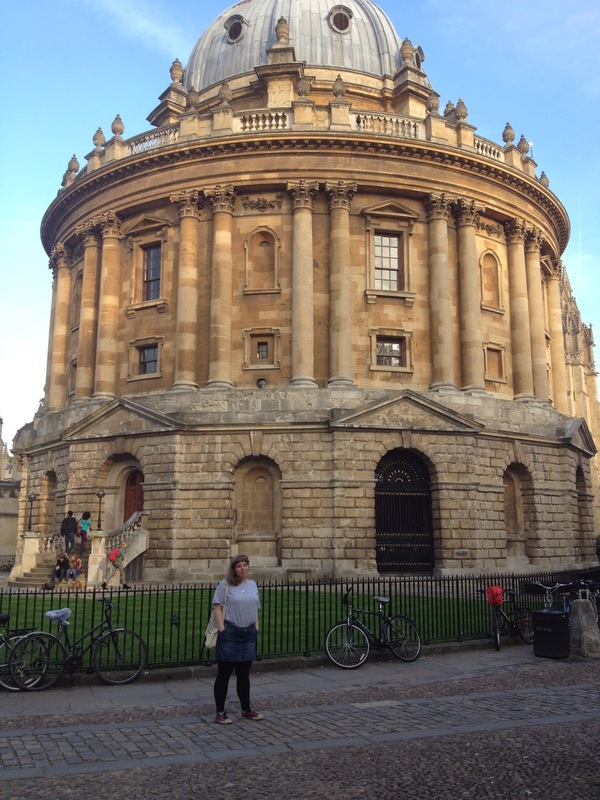 So, here's me and the Radcliffe Camera in Oxford a couple of months ago. So, er, in four weeks I'm getting on a one-way flight to Berlin? You might be surprised to find that I'm 10 times more stressed right now than I was this time last year, when I was preparing to get on a one-way flight halfway across the world. I don't have anything or anyone waiting for me in Berlin, which is a big part of it. But mostly, I think that the deeper something lies under your skin, the more you feel there is to lose. Let's flash back to 2010, when I attended a German summer school in Berlin. That was the second time I had been in the city. For context, this was just after my first year of uni, and I'd been pretty unhappy. I had made some good friends on my course but there wasn't much else about the whole experience that I liked. There had come a point where I was seriously considering dropping out and just getting a regular job in Berlin, spurred on by the fact it was cheap and arty; I even spoke to a tutor about it, who of course advised me against it. Anyway, I was staying with a host family for three weeks, commuting to this language school each morning on the S-Bahn, so I was having an experience outside the touristic norm. A couple of my university friends were also there, but I often hung out with these two American guys in my language class. One of them had grown up in Turkey, but moved to the US to study, which had been his dream. One afternoon we were walking around Kreuzberg after class, chatting and having ice cream. I was complaining about how unhappy I was in my then-situation and how I was dreading going back in September. The guy from Turkey listened diligently, casting no judgement, and responded with his immigration story: how it took him so long to save up and to immigrate to California and everything. He said that I needn't worry: since I was an EU citizen, I'd have relatively little trouble moving to Berlin. I already knew this, of course, but it was the first time anybody had validated it and had made it feel like more than just a silly romantic idea. On the last day of school, when we were all saying goodbye, he said, 'I hope you get to where you want to be', and I knew exactly what he was referring to. That stuck with me for many years. Here's to Berlin, the next chapter of Rose ailleurs.